At Lowell Animal Hospital, we understand that the bond you and your beloved feline friend share is invaluable and irreplaceable. We also understand that by nature, cats are roaming creatures and therefore run the risk of wandering too far from home, or just accidentally losing their way. In fact, a staggering number of cats are lost in the shelter system each year because they lack any means to identify them with. This is why we are happy to offer cat microchip identification services. Collar ID tags are a wonderful line of defense for lost cat, but collar ID tags can also become physically separated from your pet. However, microchipping cats ensures that they can be properly and quickly identified by a veterinarian or animal shelter. We strongly believe in the value that microchips bring to the cause of lost cats. Therefore, we want to provide you with insight and education about microchipping cats that will help you make an informed decision as to whether or not a microchipping is right for your feline friend. How Is A Cat Microchip Implanted? A cat microchip is implanted through a syringe that injects it underneath the skin. Although there is no universally agreed upon location, a cat microchip is usually implanted between the shoulder blades. At approximately 12mm long, it is about the same size as a grain of rice. Implanting a cat microchip only takes a few seconds, and it is meant to last for the entirety of your cat's lifetime. Is The Cat Microchipping Procedure Dangerous? It is important to note that side effects have occurred in a very small portion of cats, and are considered very rare compared to the tens of millions of cats who have received microchips. When it comes to microchips, the potential rewards far outweigh potential risks. Will The Microchip Implant Hurt My Cat? Microchipping cats hurts about as much as having blood drawn. The microchip comes preloaded in a sterile applicator and is injected under the loose skin between the shoulder blades. The needle required for the injection causes a pinch during cat microchipping procedures. Because it is only a momentary injection, no local or general anesthetic is required. 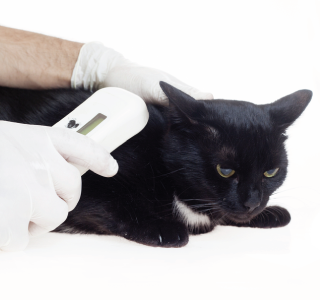 Because it is quick and fairly non-invasive, the cost of cat microchips is very reasonable. Will A Microchip Tell Me My Cats Location? It is important to understand that a pet microchip is not a GPS device providing real time tracking capabilities. Rather, a cat microchip is a Radio Frequency Identification (RFID) device. Unlike a GPS device, a cat microchip doesn't require power, and it is activated by an animal shelter or veterinarian waving an RFID scanner across a cat's body where the microchip is embedded. The scanner activates an identification number, which is linked in a database to your ownership information. Once the veterinarian or shelter get the chip's number, as well as the information about the company that made the chip, they'll contact that company to find the cat's owner. This brings us to an incredibly important part of cat microchipping: Registration! An RFID chip itself is useless if your registration isn't submitted and then kept current. Don't hesitate to ask your veterinarian any questions about the registration process, in order to ensure your beloved feline friend can be accurately identified with his or her pet microchip. Do All Shelters Scan Lost Cats For Microchips? To our knowledge, just about every animal shelter and veterinarian in the United States has the RFID devices to detect a microchip for cats. However, there are various cat microchip manufacturers, and because of this not all RFID scanners can detect every microchip for cats. Therefore, shelters and veterinarians may keep several different scanners on-hand to detect different cat microchip brands. Since cat microchips can migrate, it is a good idea to ask your veterinarian during each checkup to scan the pet microchip to make sure it is still reading, and is also still located where it should be. Why Does My Cat Need A Microchip When He Already Wears A Collar With Tags? It is a great idea to invest in a collar ID tag for your cat. Collar ID tags are the first line of defense in locating and identifying a lost animal. For example, if a neighbor finds you lost cat, they will not likely have a microchip scanner and will simply rely on the collar ID tag. However, microchipping cats is the second and in some ways most important line of defense for your cat. This is because microchipping cats ensures that your pet's identification is never lost, stolen, removed or compromised. Can Anyone With A Scanner Access My Contact Information? A microchip for cats cannot compromise your personal privacy. When the RFID scanner picks up the chip, the chip only provides an identification number that correlates to the chip's manufacturer. That number is called into the pet recovery service, and you will be contacted by that service using the contact information on file. This is why it is essential to make sure your registration information is accurate. How Can I Have My Cat Microchipped? If you are ready to bring your cat in for microchipping services, please visit us today. Our staff would also be happy to help you register your feline friend with the pet recovery service database.